The digital ocean is a reality and U.K.-based digital communications marine technology firm Sonardyne International Ltd is one of the organizations driving innovation to enable the extension of electronic and communications connectivity into the subsea domain. Based on a presentation given by Tom Rooney, Lead Trainer at Sonardyne, at the Digital Ocean conference held in Galway, Ireland in June 2017, this article describes the current state of play in the subsea acoustics and optical communications technology field, presents examples of the many ways these technologies are being applied and considers how the digital ocean may work in the future. U.K.-based subsea acoustics and digital communications specialist Sonardyne International has been a major player in the offshore energy sector for many years. Its technology portfolio has been applied to the high-precision positioning of structures and equipment, to the navigation of unmanned vehicles, digital acoustic and optical communication systems, to asset monitoring and data logging and for high-resolution subsea imaging. With millions of dollars being spent daily, oil and gas sector companies are the most demanding customers, as they expect high levels of reliability and robustness, highly efficient operations and supplier support in the harshest of environments. It was this level of expectation that drove Sonardyne’s research into and development of new communications technologies for use in the subsea environment. Maritime security is also a key market for the company, with technology and application variations on a similar theme to those of the oil and gas sector, thus demonstrating the adaptability of its technology to a wider variety of different application areas, including ocean science, exploration, aquaculture and other similar markets. Positioning – Deployed with other transponders on the seabed, Compatt 6 is used as a reference for Long BaseLine (LBL) positioning, a concept similar in operation to above-water global positioning, ie GNSS. LBL uses ranges measured by acoustic ‘time-of-flight’ calculations to determine with high precision the position of a vehicle or structure using trilateration. Compatt 6 can also be used in vessel dynamic positioning (DP) applications using an Ultra-Short BaseLine (USBL) transceiver deployed from a vessel, the acoustic ranges measured from seabed references being used to aid the vessel/oil rig hold station above an oil well or subsea structure. Finally, as a mobile transponder, Compatt T6 can be attached to a vehicle or structure to acoustically interrogate a network of LBL Compatt 6s in order to calculate its position, or it can be tracked from the surface using USBL. PIES – The Pressure Inverted Echo Sounder (PIES) unit is a variant of Compatt 6 that obtains average sound velocity of a water column by measuring both pressure and the time taken for a transmitted acoustic signal to reflect off the sea surface. The unit is also capable of measuring other oceanic properties such as local temperature, depth/tide variations, unit pitch/roll and unit battery life. PIES units store processed and raw data on an internal memory card: these data can be recovered acoustically (e.g. from a passing subsea vehicle or from the surface) while the transponder is deployed, or recovered serially once the unit is remotely released and brought back to the surface. Autonomous Monitoring – An Autonomous Monitoring Transponder (AMT) has all the functionality of a Compatt 6 with the addition of autonomous logging and text messaging and can be configured to autonomously log sensor and baseline data at user-defined intervals. The data are logged to an SD card that is retrieved acoustically while the transponder is still deployed or serially once the transponder has been recovered, making the system useful for operations such as the long-term monitoring of seabed settling and tectonic plate movement. Fetch – Sonardyne’s wireless autonomous sensor-logging node system Fetch provides the same functionality as an AMT transponder but is housed in a glass sphere to give excellent corrosion resistance for long-term deployments. The design of the housing and built-in stand allows the instrument to be ‘free fall’ deployed to land upright, thereby reducing both deployment time and cost. The main applications for AMT/Fetch units are seabed deformation and environmental monitoring and the tracking of tectonic plate shifts, subsea earthquakes and, when partnered with a surface communication gateway buoy, detecting tsunamis. Subsea Monitoring Analysis and Recording Transponder (SMART) – SMART has been developed to cover complex asset monitoring applications. Also part of Sonardyne’s Sixth Generation (6G) product range, the system combines low-power electronics, long-duration data logging, subsea data processing and acoustic telemetry into a single, easily deployed instrument. SMART has the flexibility to interface with a wide range of internal and external sensors and other data sources utilizing standard or bespoke data analysis algorithms to provide operators with key data when they are needed. The advanced capability offered by SMART enables the technology to be used as either a primary or backup subsea monitoring system for a variety of tasks such as monitoring of subsea structures including well heads and risers. The system can also be configured for mooring-line and pipeline observation, both for commissioning work and for longer-term monitoring. In fact, with its ability to interface with most data sources, SMART can be used just about anywhere information on the performance or condition of subsea assets needs to be accessed. SMART includes digital and analog inputs that can be configured to connect to multiple data sources. Internal sensors available for motion measurement include accelerometers, angular rate sensors and inclinometers, as well as standard and high-precision pressure and temperature sensors. External sensors that can be interfaced include pressure sensors, strain gauges and acoustic Doppler current profilers. For more bespoke applications, custom interfaces can be created to link to instruments such as corrosion monitors or vibration measurement tools. A low-power data logger is a key feature of SMART, enabling data received from external and internal sources to be securely archived. A key benefit of SMART is its ability to process raw data in the subsea environment to provide value-added information, while the advanced data acquisition and processing system, the heart of SMART, contains a highly capable processor that can run sophisticated user-specified algorithms and perform simple data analyses such as min/max/mean statistics and thresholding for alarms and critical event reporting. By reducing high-bandwidth sensor data to small, critical packets and by efficiently managing power consumption, long deployment times can be achieved from the internal battery pack, thereby enhancing users’ knowledge of the subsea environment. In addition, where surface analysis of the telemetered data requires a more thorough review of sensor parameters, SMART enables acoustic recovery of raw data from specified time ranges. Alternately, the system can be coupled via an Ethernet connection to BlueComm (Sonardyne’s high-bandwidth through-water optical communication link), enabling larger quantities of data to be retrieved from an ROV or AUV. All logged data can be downloaded from safe storage when the unit is recovered. The essence of SMART is flexibility and configurability, and the ability to connect to different sensors and data sources is an integral part of the SMART product line. However, these are not the only options: SMART is available in a range of materials from aluminum and aluminum bronze through super-duplex stainless steel for the highest possible corrosion resistance. Other options include longer ‘maxi’ housings for increased battery capacity and different connector types and, if required, other functions, including acoustic positioning, can be added to the monitoring system. In addition to developing acoustic technologies, Sonardyne has in recent years moved into the area of free-space optical communications, successfully bringing to market high-speed underwater modems. Bluecomm – BlueComm is a through-water wireless optical communication system that has been developed to transmit subsea data, stream video and perform tetherless vehicle control at very high speeds. The BlueComm modem family is currently made up of three variants: BlueComm 100 is optimized for shallow-water ‘high ambient light’ operating environments and offers a good balance between data rate and range; BlueComm 200 sends data at up to 12.5 Mbps and is suitable for deep or night-time operations; while the dual laser configuration of BlueComm 5000 supports data transfer rates of up to 1,000 Mbps. BlueComm uses the electromagnetic spectrum rather than acoustic pressure waves to transmit high volumes of data. Typically operating in the 450nm blue region of the spectrum, BlueComm can achieve data rates of greater than 500 Mbps. This optical data transmission technology is highly efficient, enabling 1 Gb of data to be transmitted with the energy contained within a single lithium D-sized cell over distances greater than 150 meters. The applications for Bluecomm are extensive: used in conjunction with Sonardyne acoustics, low-bandwidth data can be transmitted acoustically (for example by switching on the optics remotely) and high-bandwidth data such as video or sonar imaging data files can be transmitted using the optical method. Data from seabed data storage centers or data-gathering vehicles can be collected by AUVs and then relayed to ASVs or manned surface units for transmission to ground stations via satellite. 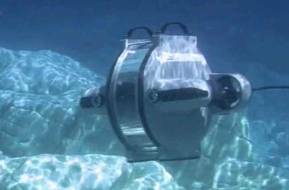 Inertial systems – To complement its state-of-the-art acoustic systems and provide the best possible positioning solutions for subsea vehicles, Sonardyne has developed its own inertial systems, Lodestar and SPRINT. Lodestar is a combined solid-state attitude and heading reference system (AHRS) that is upgradable to become the SPRINT acoustically-aided inertial navigation system. The unit is comprised of three high-grade, high-reliability, commercially-available ring laser gyros (RLG) and accelerometers. The sensors used are the standard for commercial aviation and have a proven track record of more than 15 years and a mean time between failures (MTBF) of more than 400,000 hours. Lodestar AHRS supports serial, Ethernet and industry-standard telegrams for easier interfacing and advanced outputs such as acceleration and rotation rates are also available. On-board data storage and backup battery functionality ensure continued operation and no data loss even if communications or external power is lost. SPRINT is an acoustically-aided subsea inertial navigation system for subsea vehicles that makes optimal use of acoustic aiding data from acoustic USBL and LBL positioning and other sensors such as Sonardyne’s Syrinx Doppler Velocity Log (DVL) and pressure sensors. This improves position accuracy, precision, reliability and integrity while reducing operational time and vessel costs. The system extends the operating limits of USBL transmission and can dramatically improve the operational efficiency of LBL systems. Sonardyne’s new third-generation SPRINT unit offers power pass-through to aiding sensors, thereby reducing cabling and interfacing complexity. SPRINT shares the same hardware platform as Lodestar and is a combined AHRS and INS system: running both the AHRS and INS algorithms concurrently allows inertial navigation to start or restart instantaneously on receipt of a position update, as the AHRS seamlessly provides orientation to the INS on start-up, avoiding the lengthy ‘alignment’ period common to other INS systems. Thereafter, the separate AHRS- and INS-computed orientations are autonomously monitored as an indication of system health. The levels of accuracy provided by Sonardyne’s acoustic-aided INS system SPRINT-Nav are now enabling operators to conduct mobile subsea laser mapping and metrology. Set-up and imaging data-gathering times are greatly reduced and the post-processed results achieved on the numerous trials and experimental projects completed in 2017 have been reported as meeting all user requirements. The challenges that remain to be addressed to complete the introduction of automated subsea navigation, positioning and communication center around achieving efficiency of operations and the use of smaller vessels. For example, the introduction of autonomous surface vessels (ASVs) will represent a culture change, with operator safety cases relying on redundancy and fallback systems to control vessels in the event of satellite navigation failure or error. Other challenges include the introduction and successful uptake of collision avoidance systems. Sonardyne is able to provide a complete suite of integrated systems required for marine autonomy. Platforms such as its AvTrak 6 instrument, which is optimized for AUVs, uses the company’s acoustic systems to enable long-distance, two-way low-bandwidth data and communication transfer, while the longest possible distances are achieved using acoustic-relay transponders, thereby greatly increasing the operating ranges of autonomous craft. Position data telemetry from USBL systems can be sent to a subsea vehicle’s INS navigation solution processor as part of routine tracking communications and AUV status information can be sent back via the same process. This same telemetry can be used to control systems on the AUV, such as those that update the mission, or to change the settings of on/off sensor or optical modems. In the event of vehicle failure, the AvTrak 6 will also act as an emergency locator beacon, going into standby mode to save its independent battery, and it will wake up and respond to interrogations from any Sonardyne 6G system. Sonardyne has been pioneering digital oceanography technology for more than four decades yet the list of applications for the company’s technology grows year-on-year, particularly where automation and remote operations are concerned. Modern technology can land a spacecraft on an asteroid or fly one through the rings of Saturn from a control station on earth, and therefore Sonardyne believes that the operation of an underwater drone in the Earth’s oceans is easily within human capability. The company stresses that with fewer (or no) people at sea, the provision of useable data for control, condition-based monitoring and data gathering is paramount, but recognizes that operating on or under the ocean presents significant technical and environmental challenges. Sonardyne also points out that lines of communication are not point-to-point connections, but that they rely on multiple systems working together, operating in different mediums and changeable environments and with varying bandwidths across the internet, linked via fiber optics, satellites, short-wave or local wifi networks, acoustic modems, optical modems, Ethernet connections and LANs, with a multitude of data formats, protocols and operating systems that engineers have to somehow splice together to provide the seamless connectivity expected by users. Thus the main challenge in achieving effective integration of complex systems is interoperability, with the digital communications companies working together to share information and agree on standardized data strings and protocols. The aviation and automotive industries have demonstrated the success that can be achieved by working in this way, and Sonardyne believes that all sections of the maritime technology industry stand to gain from a collaborative working approach: the digital ocean is already here – it is up to the global marine community to shape it in the way that benefits the growth of the industries that will be using it.